This recipe marked a return to my American food obsession but with an attempt at being healthy. I also quite like picking up recipes from other food bloggers around the world, taking a chance on other people’s recipes can be an easy way of picking up new ideas, and it is cheaper than buying cookery books. In fact here is a challenge, get out there, get Googling and see whatother people are cooking! 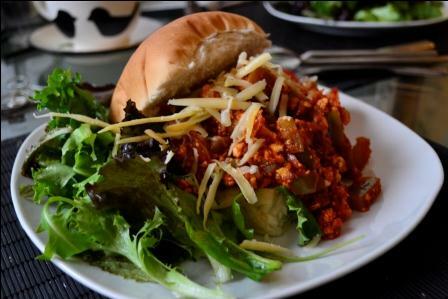 Sloppy Joes are VERY American and not common on menus over here. This recipe comes from Iowa Girl Eats with a quick cross-reference with Sheila Lukins USA Cookbook to make sure I was on the right track. I don’t own a tofu press ( I’ve no idea where you would buy one) so I might not have achieved the dry crumbly texture of Iowa Girl’s tofu but squeezing it with my hand. I’m also not sure how you are supposed to eat them, knife and fork feels too formal, but attempting to eat them with our hands was incredibly messy. I think the texture and taste might be improved by using meat, or maybe it is because I’m used to burgers in buns, but both The Man and I found them a bit odd, in a way I can’t quite put my finger on. I could get used to them, and I think if I’d grown up eating them they would probably fit the bill as comfort food really well, but I’m not sure I wouldn’t rather have the constituent parts made into a burger. I have a feeling I have missed the point somewhere with sloppy joes somehow.